Ten standard designs make up the CSC4X(6) line of stainless steel 304 or 316L control station enclosures ranging from 1 hole to 16 holes. 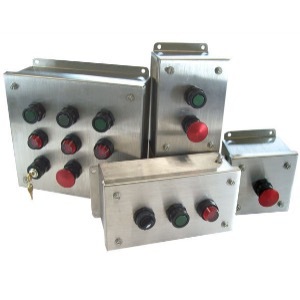 Design configurations included in-line options for 1 to 4 holes as well as larger enclosures for 2 x 2 up to 4 x 4 designs. Custom sizes and hole configurations are available up to 24" x 24". The enclosures feature a continuous one-piece silicone gasket which provides an IP66 ingress rating for dust-tight and water-tight locations. Cover hole cutouts are 30.5mm openings and are designed to house Adalet's standard line of increased safety pushbuttons, pilot lights, and selector switches.